Remember those smart computers from various works of science fiction? You know, the ones that actually give good answers? Kind of like Hal, from 2001 A Space Odessey, but maybe not as malicious. It’s here! Artificial intelligence is finally becoming somewhat functional. It’s at a nascent stage, but it’s still considerably cool. 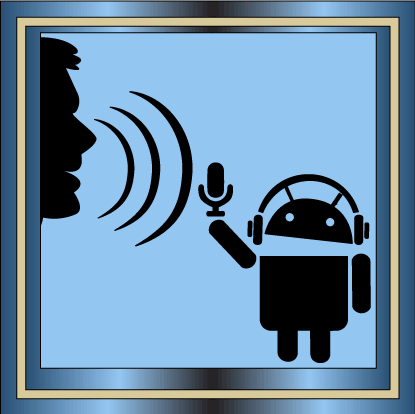 Voice recognition has come a long way and is especially useful for our tiny smart devices. Ever felt like you were doing things the hard way? By using the advanced features of voice search, you can avoid the often annoying and sometimes dangerous need to enter text into your smartphone. “Google Now” Enabled Smartphones react to “Okay, Google” when the screen is on. These features work with Android devices and the Chrome browser. 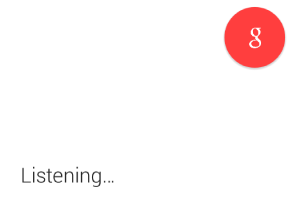 For Android devices, you will need to download Google Now from the play store. Google Now is extremely useful when on the go or at your PC. In your car, you can Bluetooth sync your Smartphone to your car’s speaker system or use an auxiliary cable to send your device’s audio to your car’s speakers. Another useful tip is to get some kind of smartphone car mount, so you can glance at your hands-free device without looking down (for example when using navigation). For “Okay, Google” to work, your phone screen will need to be on and unlocked, unless you follow the instructions below. If you have the Moto X phone then you can access “Okay, Google” with the screen off (jealous?). Well, there is a way to make it so your phone’s screen stays on when charging. This is useful for hands-free usage when driving. These are the instructions if you have a Samsung phone, although other phones likely have a similar option. You just might have to navigate around until you find it. 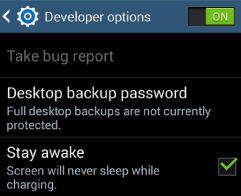 There is another menu item you can use to change how long your screen stays active. Go to screen timeout and change it to the highest setting. NOTE: You will have to manually turn your screen off. This is because, every time you turn on the screen, it’ll stay on for the time selected, which will use up your battery very quickly. 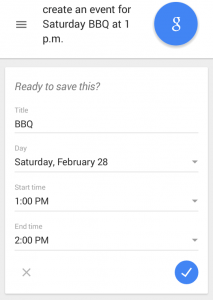 Additionally, you will need to select some options in your Google Now Voice menu. After you downloading Google Now and following the instructions to set it up, you can swipe to the left-most home screen which is the Google Now menu. It will include Google Now Cards that you designate as well as recommendations. Here is where you need to go. Hit the menu item in the top left and select Settings > Voice > Ok Google Detection. 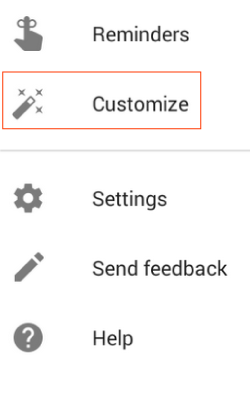 Once there, you can turn on the feature to use ‘Ok Google’ from any screen and/or from the Google App. The last step is figuring out how to charge your phone while in your car. Okay, this is the easiest step and I’ll leave that to you. The Retrain Voice Model option has you say “okay, Google” three times, so Google can better recognize your voice. The following are examples of what you can do with voice search. Tip: Add a Google search bar widget to your smartphone screen for easy access to the microphone icon (found on the right side of the search bar, activates listening mode). Or, download Google Now and use it for your home navigation. When activated you can use Google Voice hands-free by saying “Okay, Google”. Google Now also places a search bar on every page in your home screen. Of course, “grocery store” can be replaced with any other type of destination, maybe Chipotle, the nearest bar, or the nearest library, it’s your choice. Alternatively, you can use a Contact’s name (make sure their address is in “Your Places” for Google maps). Alternatively, you can visit Google Contacts and enter addresses on your laptop or PC, which will be easier than using the smart phone’s keypad. This is the easiest way and my preferred way. If there are multiple results Google will show you a map with the nearest options and ask you to pick one. While you drive, physically interacting with your phone can be hazardous so instead, say “navigate to nearest _____”. That way google will pick the destination with the shortest distance to you. Either way, you can now be indecisive while driving and avoid taking your eyes off the road, seriously too many people do this. How about navigating to your car? Well, you can Customize your preferred transport to car and google will remember every time you get out of your car. Go to Customize in the Google Now Menu select “Everything Else” and make sure the item “Continue to get reminded of places where you parked your car?” is set to yes. If it is set to no, tap on the item and change it. Google Now navigation isn’t just for people with vehicles. By selecting your mode of transportation, you can quickly get the most optimal path using various types of public transportation. Here in Chicago that might mean walking to a Metra Station, then getting on the L (Elevated Train), and then getting on a Bus. When you select options you can choose to select: Fewer transfers, less walking, or simply the best route. You can also specify your preferred mode of public transit: Bus, Subway, Train, Tram/Light Rail. If the person you want to call is in your phone book, just say “Okay, Google, call (my friend’s name).” Especially useful, if you have many contacts in your list. If you find yourself calling a place like this often, maybe consider adding it to Google Maps “Your Places” for hands-free dialing. With Google Voice, it is easy to create an event either on the go, at home or the office. Either say, “okay, Google” or click the microphone on the right side of the search bar. Then say “create an event” followed by whatever information you have about the event, such as BBQ on Sat at 1 p.m. The details of the event will auto-populate in the form fields. All that is left is selecting the check mark. As of now this works in Chrome but there is a bug to fix for mobile. More on this as it develops. Subscribe to our newsletter to get updates as we publish them. Do you find yourself forgetting to complete tasks? Not a fan of carrying around a to-do list? Here is a way to set a reminder based on time or place. Granted, to take advantage of GPS-based reminders you will need to get Google Now installed on your phone. 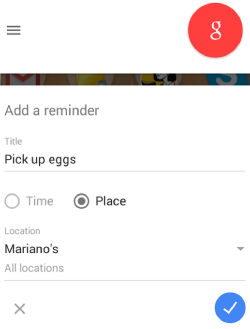 After activating Google’s listen feature say, “create a reminder to pick up eggs next time I’m at the nearest grocery store,” Google will create the reminder form, which you can then review. This is what it would look like using voice search on a PC using the Chrome browser. Maybe the nearest grocery store isn’t the one you go to, so you can change the place. Alternatively, change it to a time (such as tomorrow on your way home from work, five thirtyish). 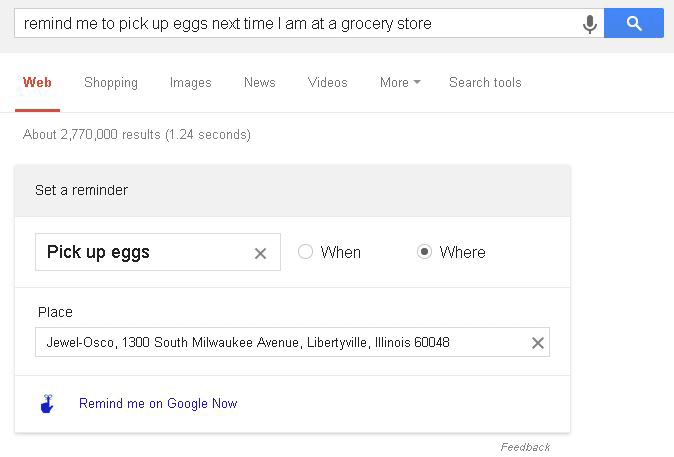 “Okay Google, Remind me to get eggs next time I’m at a grocery store”. This command results in your phone finding a nearby grocery store and creating the reminder. Mariano’s happens to be the closest grocery store to my home, which is why it was auto-populated in the location section. Either way, whether you set it on your tablet, PC, laptop, or mobile phone, you will now get a push notification on your cell phone at the appropriate time or when you are at the appropriate place. If you’re a curious individual, you may want to add new words to your vocabulary. It is easier, more now than ever, to learn more about any given word. 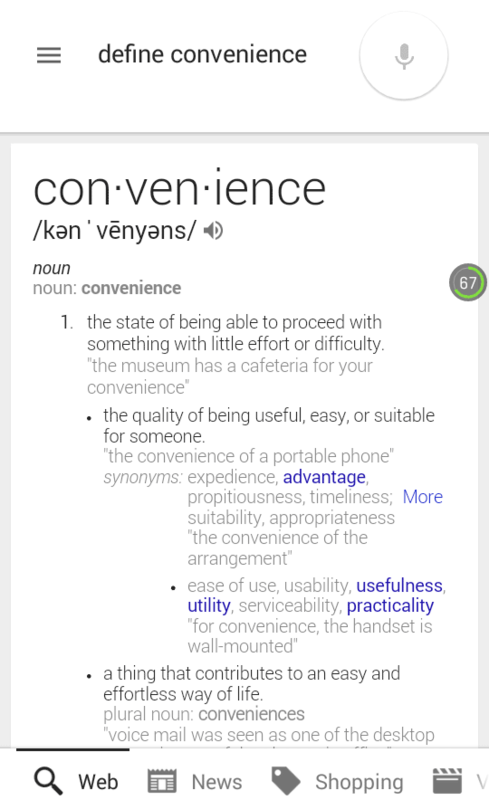 Start with “define convenience”. When this is either picked up by voice search or typed into the search bar, you’ll see an example of google’s knowledge graph. You can select the speaker icon to hear the word enunciated, as well as view the phonetic spelling to help you assimilate this new word into your vocabulary. To go further, you can read the variations on the word, usage in a sentence, a rather lengthy list of synonyms and other country’s usage of the word. 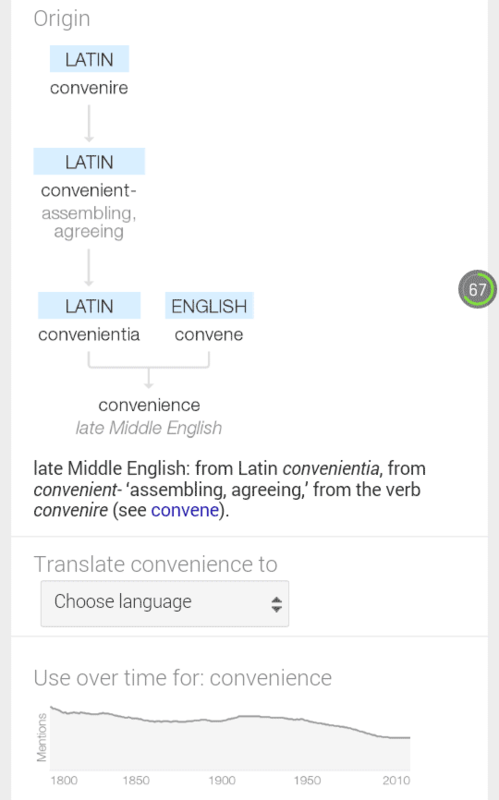 In the case of our example word “convenience”, it means restroom in Britain. Google Knowledge Graph also goes a step further than many dictionaries and provides you origin information along with options to translate and a usage over time chart. In your preferences, you can set your secondary language so that it will always show the preferred translation (only if you are signed in). This tool can be an empowering source of self-transformation. Mainly because it is difficult to express yourself if you have a limited vocabulary, and today is the best day to start on your path to a new you. Let’s imagine that you are currently on an awesome vacation in France, but you don’t speak French. Uh-oh, Wait… Google to the rescue. Google will speak on your behalf — the concierge may look at you in a funny way, but at least they’ll know what you meant. If they didn’t hear you the first time, you can turn up the volume and hit the speaker icon again. Instead of doing what I just said, go ahead and download Google Translate to your phone. This app is actually much better for back and forth communication. As of now, this app is the closest thing to Star Trek’s universal translator. Actually, Skype already has one but it’s currently only available on Windows 8. WHY?? Anyway, try this, say “Okay, Google, open Google Translate” or put the app on your homepage. You can select the two languages for the conversation. Simply say “open YouTube and search for Google Voice Tips”. It was likely a long time ago, but now you don’t have to annoy anyone with your incessant questions because Google won’t ever tire out. How tall is the Eiffel Tower or some other structure? What is the average lifespan of a tortoise? “What is” questions about any topic? What is the weather this weekend? How old is a celebrity, think of anyone famous, like Elvis for example. You don’t think he’s really dead, do you? You can also make a statement to get more info about it. The point is if the fact exists out there, you can likely ask google about it. Okay, that’s enough randomness. Wait, did I forget to mention travel? Yes, these questions are great when you are in new places. You can find the nearest “anything”. What is a 20% tip on $156.72? 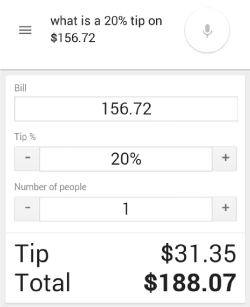 – This will bring up the google knowledge graph section where you can select the number of people, the % of the tip and the bill amount. This way you can get the tip and total and divide among everyone equally. Don’t get carried away though, it’s useful to exercise your mind to calculate tips, so use this at your own peril. Parts of your brain are like a muscle, that is if you don’t use it, you lose it. Now you can use your flashlight app by saying “Okay, Google, turn on the flashlight”. Depending on which app/phone you have, the flashlight will either default to on or you will have to tap the screen to turn it on. The same applies for WiFi and Bluetooth, however it’s pretty easy to do this from the regular menu, at least for most phones, so depending on what you are working with, this might be a shortcut for you. Either way, these shortcuts can save a couple seconds. Not too significant but can be a time saver if you do this often. Especially useful if this needs to be done hands-free. If you own a nest, you can now control the temperature with a voice command. No need to even distract yourself from the task at hand. Just say, “Okay, Google, set the temperature to 72 degrees”. Now if that didn’t blow your mind, how about this. Set GPS based rules so that Nest starts to warm up your home when you are x miles away. I know, I digress, the GPS-based rules don’t involve a voice command, but it’s such a cool feature that I couldn’t help myself. In addition, voice search will recognize many variations on ‘set the temperature’. Check out this list of different commands for changing the temperature. For those that time travel, you may want to ask google “When am I?” or maybe Star Trek is your thing – ask – “Beam me up Scotty”. “Make me a sandwich” – Harry Potter style, magic. Technology never stands still and that means you should check back here for updates. Or you can sign up for our newsletter to get the latest articles right in your inbox. This way we can get you more info on Voice Search, as it becomes available. Your email is safe with us and you can opt out whenever.